In ancient China, it’s been said, people paid their doctors retainer fees for staying healthy. If a person got sick, the payments would be suspended until the doctor brought a patient back to health. To a Western healthcare consumer, this approach may seem unorthodox. Yet, each paradigm has its own merit; and, perhaps, the lessons from healthcare can be translated into the lessons of business strategy. External affairs, also referred to as Corporate Affairs, aren’t uniformly organized, but usually include departments that cover public relations, government and regulatory affairs, public policy, corporate social responsibility, etc. So what is the function’s role in keeping the business agile? Drawing on the wisdom of ancient China, one could argue that the key to corporate health and longevity is preempting problems, rather than fire-fighting. 1. Uphold strong competence in advocacy to maintain and advance existing business interests, while expanding the mandate of the function to look beyond the present challenges and dedicate at least an equal amount of resources to future opportunity creation. 2. Empower external affairs department to lead in certain aspects of business strategy. There is a distinct difference between execution and formulation of strategy, and until the external affairs have the seat at the table when the latter is being decided, the function will be relegated to dealing with the priorities of the past and present, rather than creating future opportunities. 3. Realign incentives around the width, the breadth, and the strength of partnerships that the corporate-affairs team has achieved in addition to the problems it helped solve. To leverage the value of network, which some experts anticipate to be an organizing principle of future economy, a corporation must first embed itself in such networks above and beyond commercial relationships. 4. 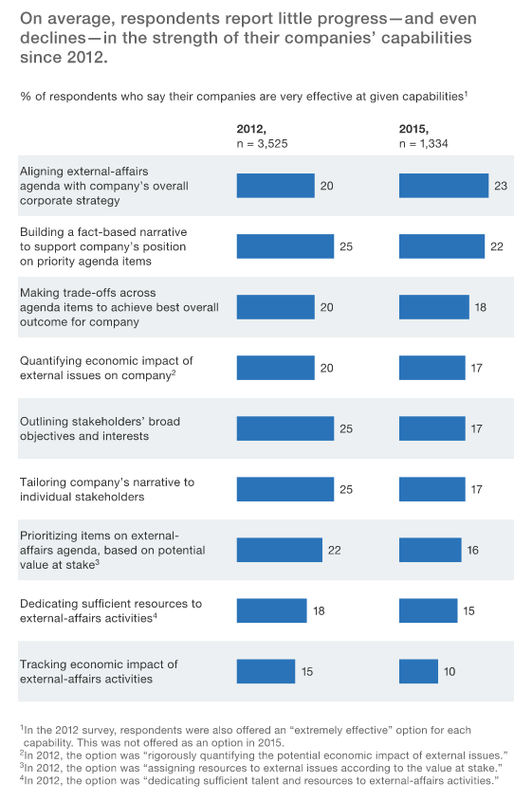 Recognize and accept that the economic impact of efforts by external-affairs departments is near impossible to quantify (as the McKinsey study suggests), the simplest solution would be to accept that the function is paramount to value creation and therefore should be staffed with strongly skilled specialists, well-resourced, and amply represented in all relevant management processes. In the age of data-driven decision making, this proposal is nothing short of anathema; yet the alternatives seem worse. Underfunding and deprioritizing the function because the outcomes it generates are difficult to link with quarterly results, is hardly a better option. Beyond the practical consideration, perhaps an even greater impact can be generated as companies become more mission-driven. When social responsibility and value creation through partnership are intrinsic to corporate culture, the aforementioned adjustments might emerge organically and wouldn’t have to be mandated from the top. To gain a wider perspective on reinventing external affairs, it is worth considering the changing nature of competition. Enterprises have moved on from product differentiation and process optimization to customer-experience design. Going forward, the question of how corporations do things, rather than what it is that they do, will become increasingly important, according to Dov Seidman. In his book “How,” Mr. Seidman makes a compelling argument that the future of competition will be anchored in corporate behavior. He describes a world of totally transparent business affairs spurred on by the ubiquity of information. In this framework, proactive external stakeholder engagement is a ticket to sustainable competitive advantage. Doing well by doing good, as a core principle of business strategy, had worked for a precious few among the Fortune 500 companies so far. Nielsen – a marketing company that popularized this concept – predicts that doing good, henceforth, might become a prerequisite for doing well. Here again, the external affairs departments are best positioned to lead the way and help corporations connect the synergy dots of public and private value creation. Today’s corporations are often well geared to fight the legislation that negatively impacts them. When the 4th Industrial Revolution promises to scatter all the bits and pieces of modern business strategy, is that still sufficient? Focusing on common ground with governments might reveal opportunities, which could otherwise be obscured if the framing of the public-private relationship is more contentious. From ancient China to modern Europe, the paradigm shift in the healthcare model is not about the preference of one approach over the other, it is the combination of the two. Juxtaposing healthy diet and exercise to prescription drugs and surgery yields a false dichotomy. In this vein, global multinationals will be best served by external affairs departments which are skilled at putting out fires as well as they are empowered to proactively engage with stakeholders, positioning their companies for long-term success. * The views and opinions expressed in this article are those of the author and do not necessarily reflect the official policy or position of VimpelCom Ltd.